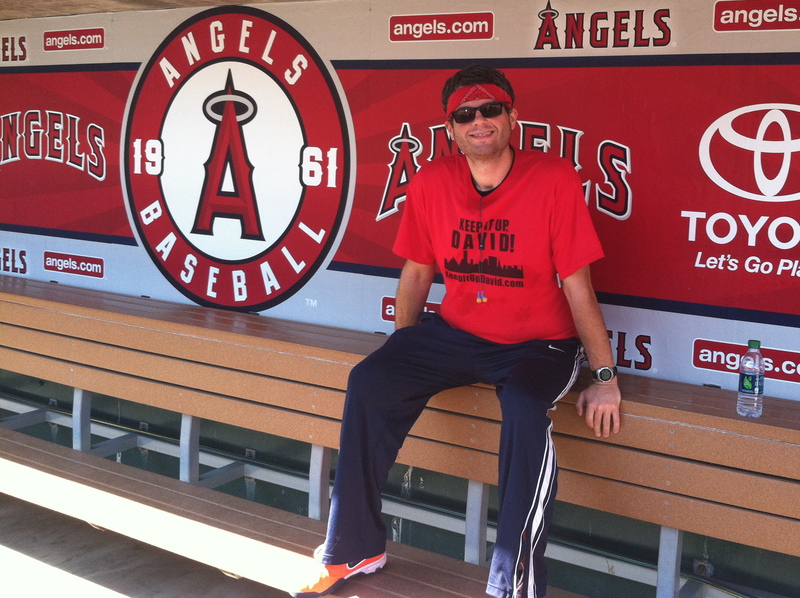 Race Recap: Hike the Halo 2013 | Keep It Up, David! Check it out! 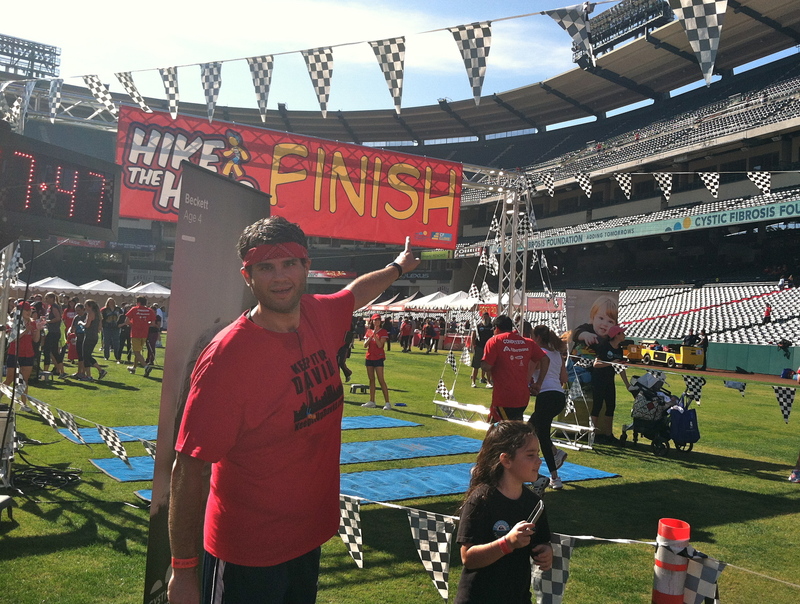 Here I am after crossing the finish line at Hike the Halo! 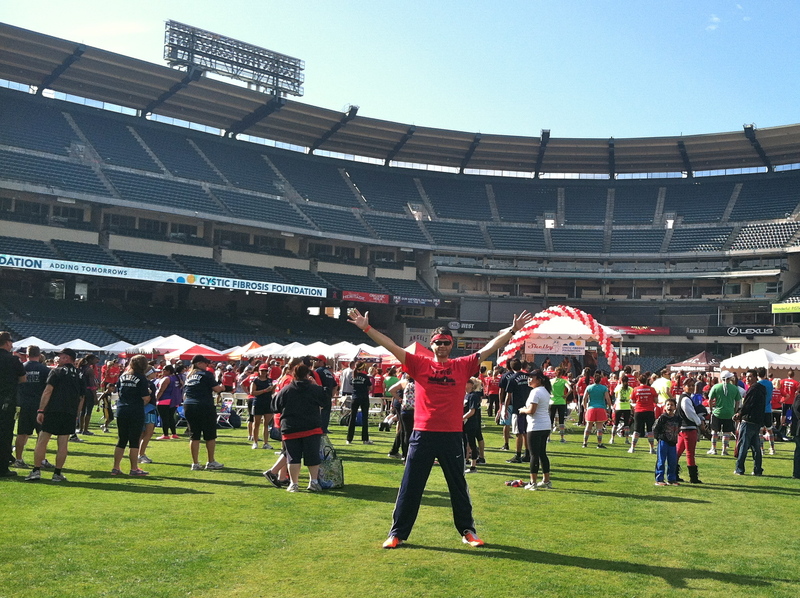 I’m still on a pride-induced high, because yesterday’s Hike the Halo race was an tough one… and a lot of fun! 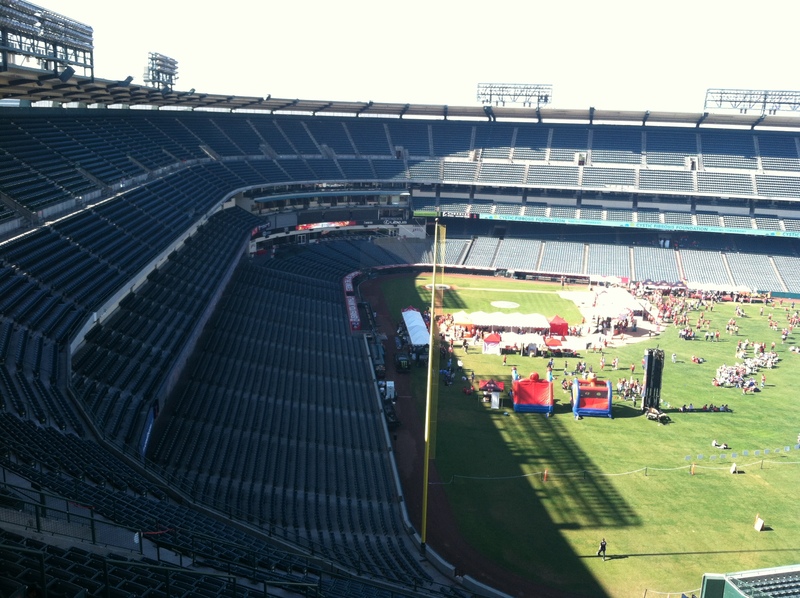 In a nutshell, the 2-mile course wove its way up and down the stairs of all the sections in Angel Stadium – over 2,000 in total. I have a lot to share… and a lot of pictures… are you ready? 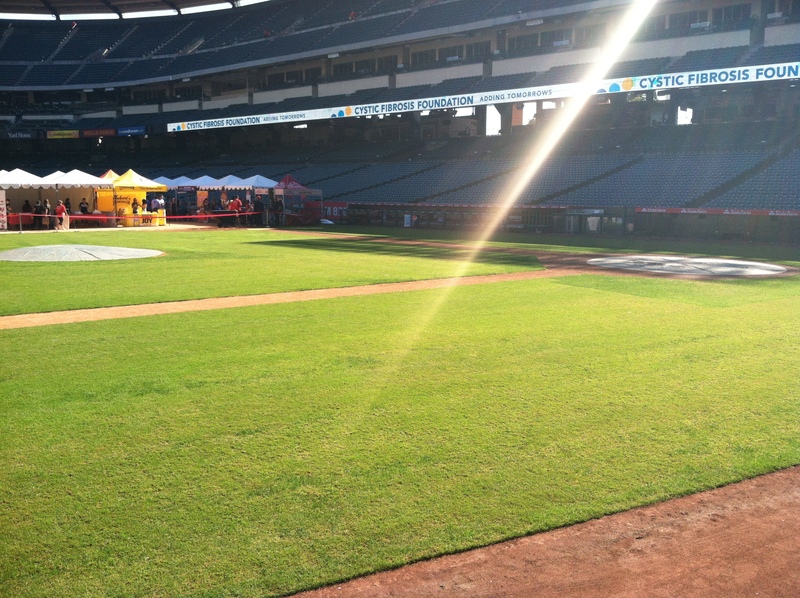 Registration happened outside the stadium, but after I got my wristband and timer chip, I walked into the stadium and onto the outfield. 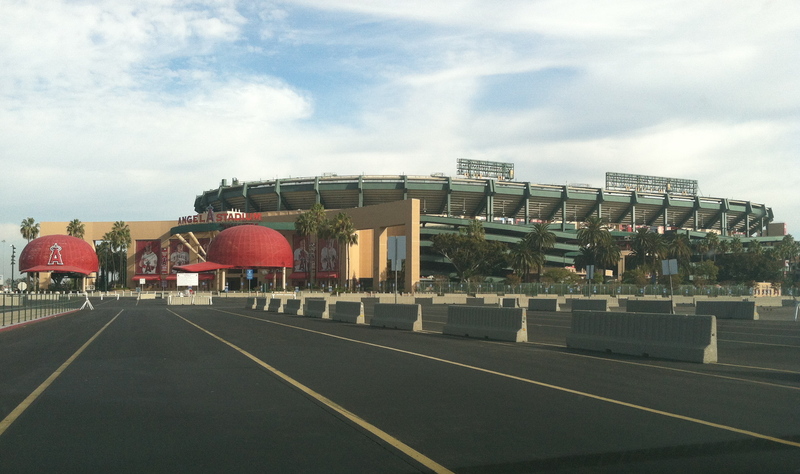 It was overwhelming, even for someone like me who is not a baseball fan. I can imagine the adrenaline that MLB players must get when they look around and see 45,000 fans cheering them on. There are seats – and stairs – everywhere! Your eyes aren’t deceiving you: that is a Keep It Up, David shirt. It’s new! There’s a better picture of it here. The course was all around me. I was somewhat familiar, because the Cystic Fibrosis Foundation (CCF), which ran the event (and benefited from it, as it’s a fundraiser), published a map on their website a few weeks back. 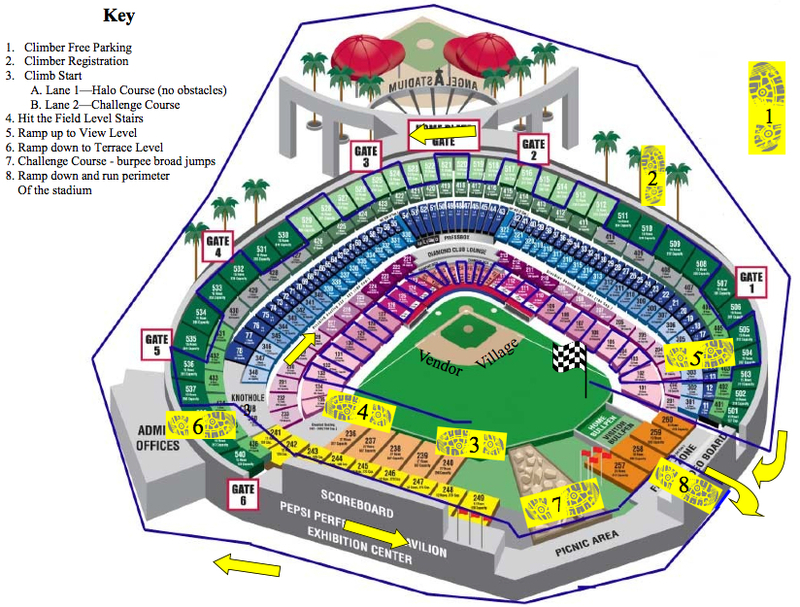 The race starts in the outfield, and you first race up and down the aisles in the lower deck. Then, you run to the upper deck, and race up and down all those aisles. After that, you run back down, leave the stadium, and run a complete lap around the exterior, before running back into the outfield and across the finish line. There’s two ways you can complete Hike the Halo. There’s the Halo course, which is just running and stairs. There’s also the Challenge Course, which adds obstacles like burpees and push-ups. I opted for the Halo course. That was plenty enough for me! Soon, it was time to gather at the starting line. This event was much looser than other stair climbs I’ve done (this is my fourth stair climb race; read about the other three here). Participants start in waves, so the narrow aisles aren’t jam-packed, but you can pick whatever wave you want to be in. I picked the very first wave, alongside friends who are nationally-ranked stair-climbing pros. I was happy to be in the first wave, because I was hoping that racing alongside faster folks would help keep my pace up. That strategy worked. The race began, and we bolted across the outfield to the first set of stairs. My main goal in this race was to establish an aggressive but steady pace. There were a lot of stairs ahead of me, plus lots of running, and I didn’t want to conk out too early. The best part of this race, compared to skyscraper races, is that you can see the course all around you. It’s great to race outside, instead of in a tight, ugly stairwell. I kept my eyes on the runners ahead of me, and even passed a couple, and by the end of the lower deck steps, I was in fourth place. Holy crap, fourth place! 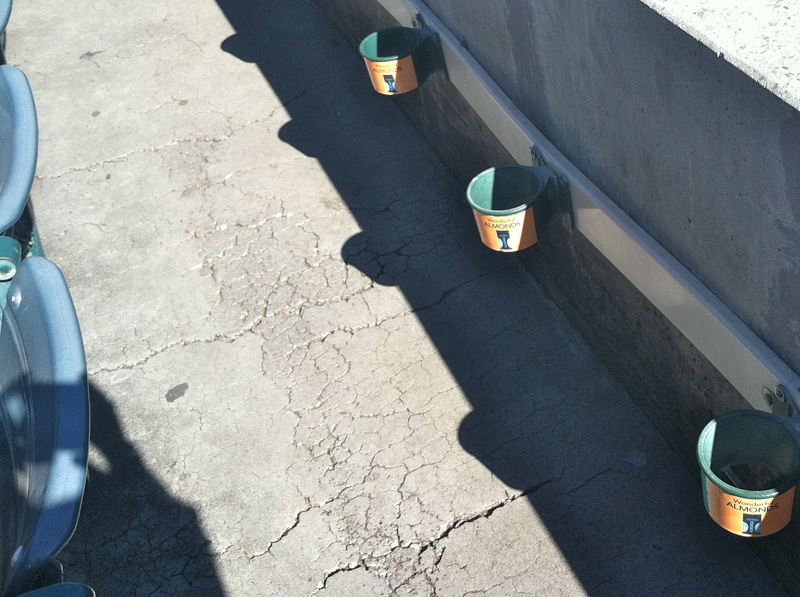 They were steeper than the lower deck, and I really started feeling it in my legs. The upper deck itself was merciless. The stairs were severely steep, and took a while for me to adjust. My pace slowed considerably. But I never stopped, and I’m proud of that. Plus, great views! I got passed a bunch of times. It turns out the upper-deck stairs were optional! If you didn’t want to do them, you didn’t have to! I did every single stair – I didn’t drive to Orange County to not climb stairs – but tons of people opted out of the upper deck stairs, so they all passed me, as their route was significantly shorter. 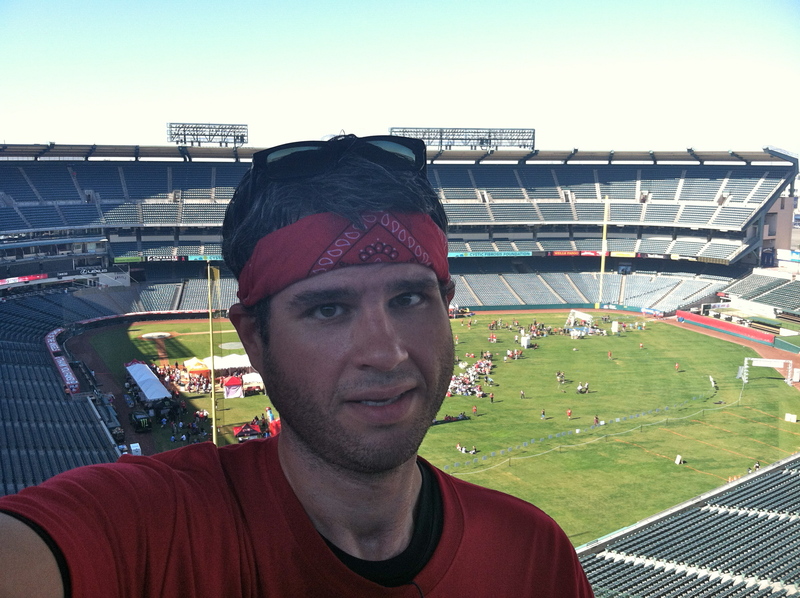 By the end of the upper deck, I was pretty tired. Not as tired as I would’ve been in a skyscraper, and that’s thanks to the running in between aisles. While I never stopped, I did use the running portions to recalibrate my pace and catch my breath. But my pacing turned out to be spot on, and I still had a little fuel in my tank, and that’s a good thing, because distance-wise, the race was only half over. I may have been done with the stairs, but there was a mile-long run still to come. It was during that mile-long run around the exterior of the stadium that I caught myself chanting “don’t stop” over and over, under my breath. I kept pushing and pushing, to the point where I was panting, but I kept my legs moving. They had a sign posted when we were 100 yards from the finish line, and that’s when we turned and headed back into the stadium and onto the field. It was at that turn that a guy appeared from nowhere and passed me. My hyper-competitive nature kicked in, and I vowed to beat this stranger to the finish line. I don’t know how I did it, but I kicked it up into a sprint, passed him on his left, and crossed the finish line before him. It took me 20 or 30 yards to come to a stop, and then, my legs on fire, I collapsed face-first into the grass. It was over. I did it. Then I wandered through the vendor village, picking up free samples, before checking official results. I came in 22nd place! My time was 30 minutes and 20 seconds, and I’m ecstatic about that. Even better, I came in THIRD among Men 30-39! That said, the timing for this race was a mess. Not everyone was timed – you could choose not to wear a timer chip. People doing the Halo course were ranked separately from the Challenge course, which is confusing but fair. But everyone that did the Halo course was lumped together, whether or not they did the optional upper deck stairs. The top finisher among Men 30-39 beat me by seven minutes, but I may have done 1,000 more steps than him. Ultimately, though, I didn’t do this race to compare myself to others. I did it to prove to myself that I could, and I rocked it. It was also fun hanging out with friends I met at previous stair races. 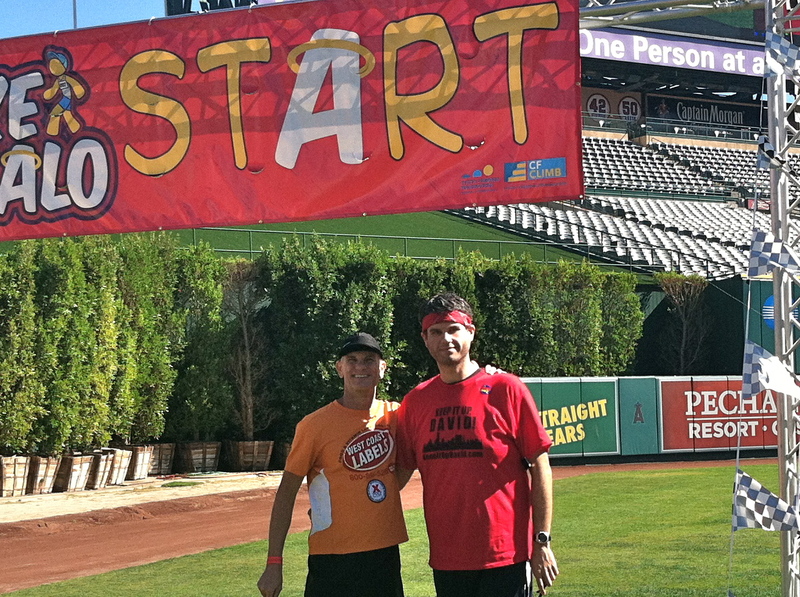 Here’s me and Jeff Dinkin at the start line. Jeff, by the way, came in first, beating everyone. Madeleine made headlines last week when she raced to the top of the Willis Tower in Chicago just days after undergoing breast cancer surgery. She’s ridiculously inspiring. From left to right there’s Jeff, Jenny, Me, Madeleine, Veronica (top female finisher), and Jonny (second place among men, one second slower than Jeff). 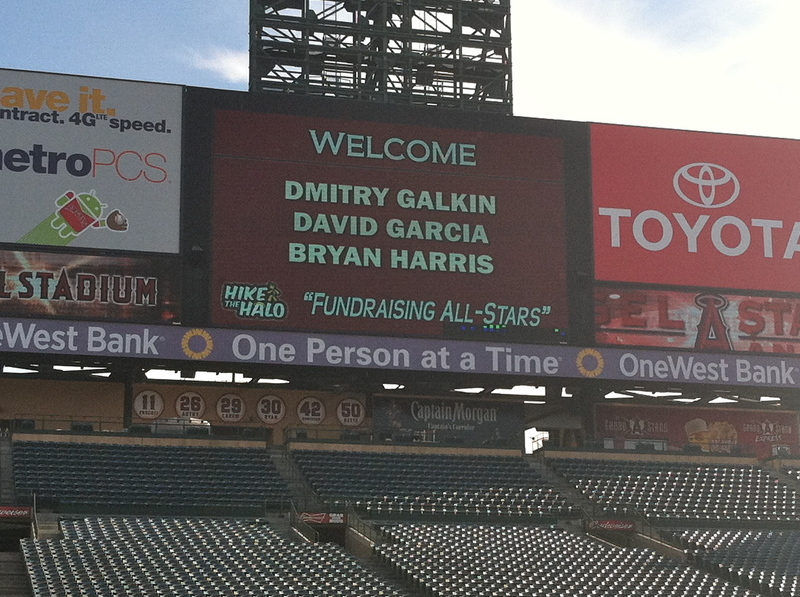 I got one more awesome photo to share: my name on the Jumbotron! This happened because I exceeded the minimum fundraising goal. In total, my supporters donated $195 to the Cystic Fibrosis Foundation, and I want to thank them again for opening their wallets and purses so I could race. Big thanks to Ron and Chris, Amy, Laura, Linnea and Robert, Margo, Janet and Jen! 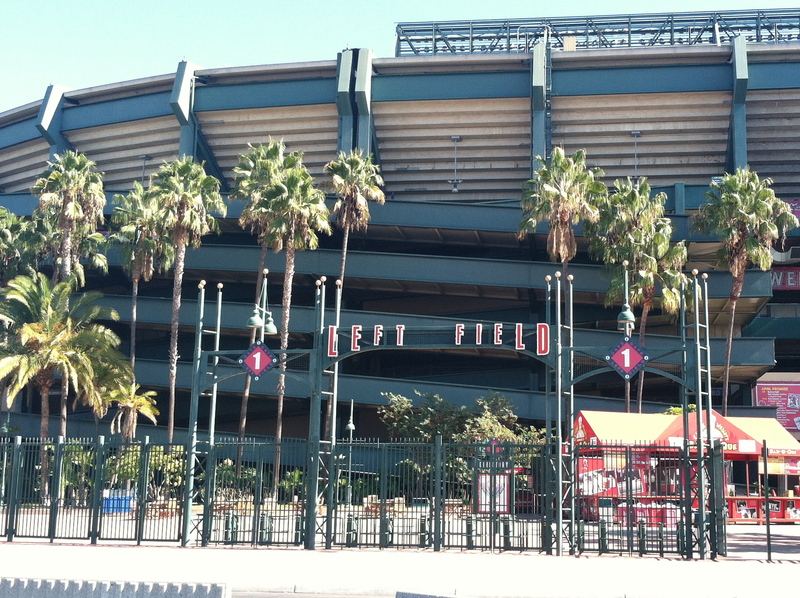 A final thought: during that final run around the stadium, something occurred to me. Here I was, at a venue celebrating team sports, but I’ve never really excelled at team sports. I spent a childhood of recesses being one of the last kids picked for a team. I used to dread gym class because I was heavy, slow and weak. Look at how things have changed. I’m none of those things anymore. And while I still wouldn’t excel at a team sport like baseball, I’ve done a complete 180: I used to dread physical challenges like this race. Now, not only do I welcome them, I tackle them with every single thing I’ve got! And I’m tackling another big race this weekend: another CCF event, up the stairs of a 51-story skyscraper downtown! This entry was posted on Monday, November 11th, 2013 at 1:05 am and is filed under Uncategorized. You can follow any responses to this entry through the RSS 2.0 feed. You can leave a response, or trackback from your own site. CONGRATS!! Don’t you just love the things you can do now. I love every step I can take and every push up I can do. Great job David. Keep it up! Congradulations, David! I guess it’s safe to say, you “Blew The Roof off The Halo!” And yes you definitely rock in my book! Thanks, Lannette – appreciate it! Great hanging out with you yesterday, David! Really awesome race! You are totally legit! See you this weekend at the next climb event! Congrats David!!! Wow you are simply awesome! Thanks for being such a great inspiration to me. I am just starting my weight loss and fitness journey and your journey has really inspired me. That’s awesome to hear, Dana. Good luck and KEEP IT UP! Loved reading this David, thank you for the constructive criticism, we are already brainstorming how to make this a better event next year and how to separate the courses so the more intense climbers can be unhindered by the more casual climbers. Feel free to contact me if you have anything else to share. 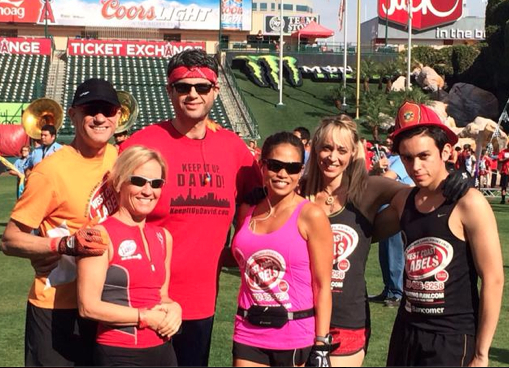 Thank you again for supporting this great cause and for your participation! Thanks for reading my post, Amy – I sent you an email yesterday evening with some additional thoughts. I had a great time on Sunday! By the way David — I wanted you to see this, as I don’t think you know about it. Oooh thanks for the update, Jeff! I do love being on rooftops! See ya on Saturday, pal. What a great read! It’s just like reliving the climb all over again. It was great racing with you David! Thanks for the shout out too – but know that you inspire me with your positive attitude and motivating spirit! See you at the next climb!! Thanks for stopping by and checking it out, Madeleine! Great job and see ya at the next one!